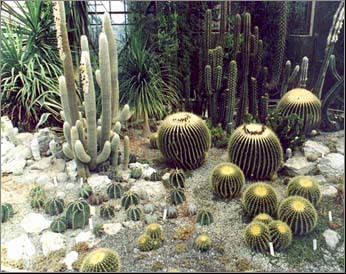 The collection of cacti of the Nikita Botanical Gardens contents many unique plants, such as large plants Echinocactus grusonii Hildm. age near 45 years and diameter 65 santimeters. These plants were grown from seeds and began flowering since 1980. These plants blossom from July up to the first half of September. Their flowers are yellow, 4-5 cm in the diameter, located on the top of plant. At the last years about ten thousand seedlings were grown from seeds. The pride of collection is a big Espostoa lanata, height above 2 m. Its areal is from the south of Ecuador up to the central part of Peru, where they grow on the height of 2500 m above the sea level. The plant in Nikita Botanical Gardens was received as seedling from G.Volskiy (Leningrad) in 1975.The first cephaly was observed in 1993, but first blossom was only in 1997 after carrying the plant to a new exposition greenhouse. After that the plant ramilied with candelabrum stems. Stems are covered with thick white hairsprings. Flowers appear from cephaly and blossom only during one night. The flowers are white, 4-5 cm in the diameter. After the move from the old nursery to the new greenhouse at 1996 are blossom for the first time such large plants as: Marginatocereus marginatus, Rooksbya euphorbioides, Neobuxbaumia polylopha. Here is a short description of these plants. Marginatocereus marginatus. This is a large tree-type plant with the stem 3 m height and 30 cm in the diameter. Areal of Marginatocereus marginatus is the central and south areas of Mexico. This plant gives ground dark-green shoots near soil. On the native conditions adult plants reach 7 m heights and 20-30 cm in the diameter. Dense white areols was situated sufficiently tightly. In collections of Nikita Garden a blossom is in the morning time (from 5 to 10 o'clock), rather then in the night. Flowers are white, with yellow-green external petals, 5 sm to long and 3 sm in the diameter. In 1997 the blossom of this plant was observed at the beginning of May. Gross amount of flowers is about 340. Flowers are situated with south sides, mainly on one of "bands" of lowerred areols. Rooksbya euphorbioides. Light-green stem as a column, 3-4 m height, not giving lateral shoots. Natural areal is Mexica: from Tamaulipas before Puebloa and Oahaka. Thorns are black, hard, 2-3 sm lond. Flowers are rose-red, 8-10 sm long. All five plants, available in collections, in 1997 were distinguished by the ample blossom (second half of june-july). Fruits are yellow-green, longer with brisles, disintegrating in the longitudal direction. Seeds are multiple (150-300 items in each fruit). 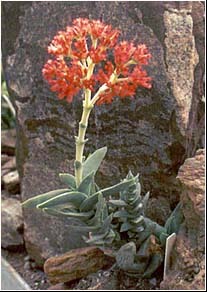 Neobuxbaumia polylopha. Stem is light-green, 5-7m height and 40 sm in the diameter, not giving lateral shoots. Natural areal is Mexica, state Hidalgo. Ribs before 50, low, thin, sharp. Thorns are dark-yellow, erect, thin, needle. Flower is crimson, 3-4 sm to length and in the diameter. Fruits with thorns. 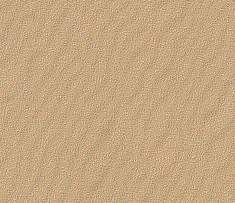 Seeds are light-brown, brilliant, multiple. All five plants successfully blossom and give a fruits. Enumerated above species are successfully blossom and give a fruits in conditions of Cacti Greenhouse of Nikitsky Botanical Garden and have got a simple in culture.